Every time I visit Seoul, I am armed with a whole new list of "must-eats". 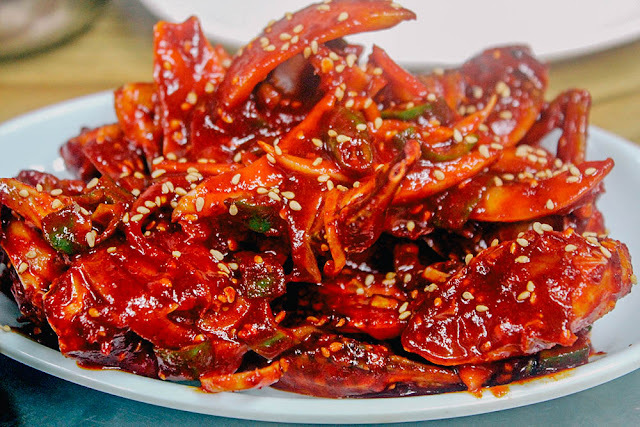 I've seen this dish on variety shows a few times (by that I mean - Running Man), and always wondered how it tastes like. 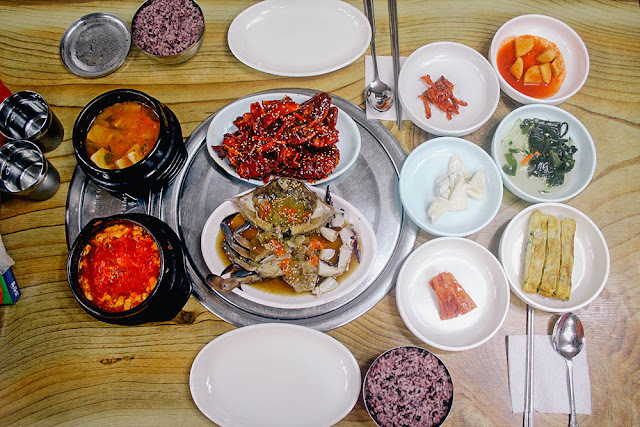 I had googled for a place that serve this dish in Seoul, but it's not a common dish as say bibimbap, or bulgogi, and most places that do serve it was like friggin' expensive (budget conscious me just couldn't bear to fork out that much moolah). 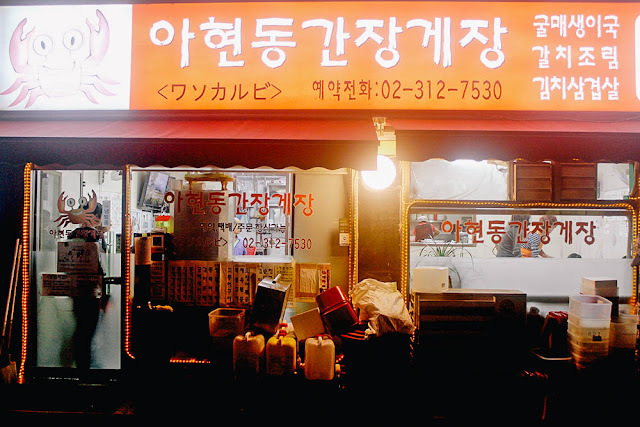 I was delighted to chance upon a blog recommending this affordable place (and the review was in English too - thank the heavens for that), and it even had detailed instructions on how to get to the restaurant too. Bless the kind blogger for that. I planned our itinerary as such that we would visit this place after our trip to the hair salon as it was only one train stop away from the place we did our hair. So after a super long session at the hair salon, which sort of amount to a short flight duration (I'm serious), it was time for dinner. Both of us had never tried raw crabs before. 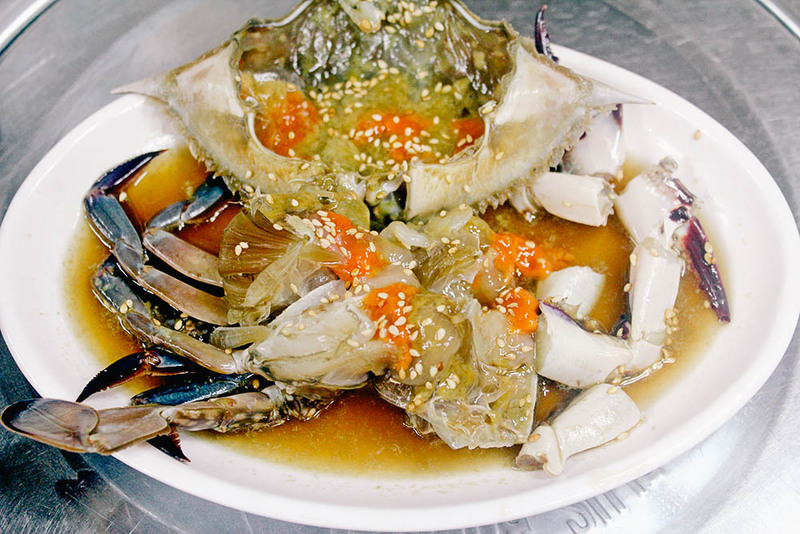 Essentially, 간장 (Gangjang) = soy sauce, 게장 (gejang) = crabs. 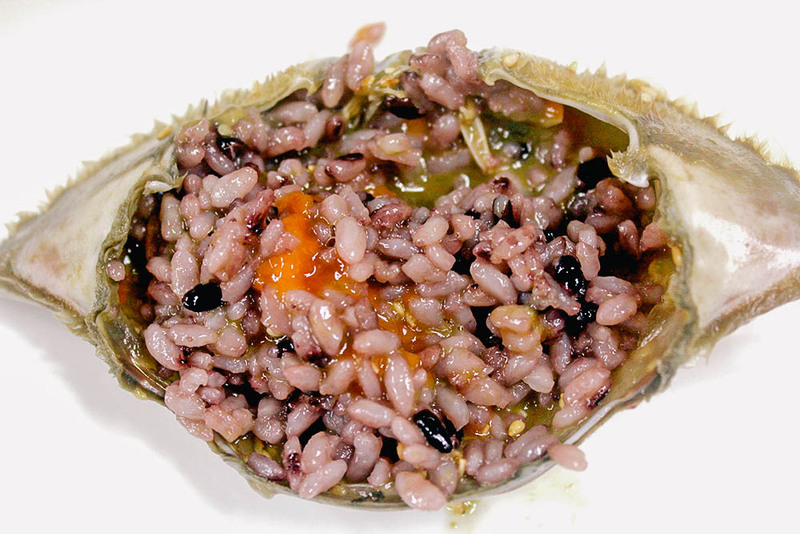 The crab meat is raw. Yes, you read that right. There were various options on the menu, but we ordered one each of the spicy and soy sauce marinated crabs. I had a lip rash before I went for the trip. So I was actually supposed to avoid spicy food. Well, looking at that fiery red dish, you must know what happened...ha, no my lip rash didn't get any better. But hey, I simply couldn't pass up the dish just like that when I love spicy food! Between the spicy and soy, I actually preferred the spicy one cos I thought the soy one was too salty for my liking. Smush some rice (it's multi-grain rice, for those of you health-conscious ones out there) into the shell and mix it thoroughly with the crab roe, then proceed to stuff your face with those glistening rice bits. And that, was the essentially the essence of this dish man. It's a locals-only joint. The place was filled with Korean families having their regular weeknight dinners, and couples on date nights (erm, let's hope there were no first dates going on - it could get messy haha). I love such mom and pop stores where it's not packed with tourists. Definitely a recommended spot to try if you are adventurous with food. I would love to visit again (sans lip rash) to really taste the dish again. That drat lip rash thing going on didn't allow me to fully enjoy my meal. Get there: Ahyeon Station, Exit 4. Upon exiting the station, turn around and you should see KB Bank. Turn right and continue walking all the way straight. Cross the zebra crossing to the opposite side of the road, and make a right turn. Turn left into the next turn. The restaurant is located along the street when you make a turn.